This is my last pumpkin post of the month. In support of the LTU October pumpkin event, I have the opportunity to try out these pumpkin recipes - Pumpkin Tofu Cheesecake Jar, Pumpkin Ondeh Ondeh and Pumpkin Hokkaido Chiffon cupcakes for the past few weeks. Today I am going to share with you my latest successful experiment of this 50 minutes Amazing pumpkin buns. About half a year ago, when I discovered the 40 minutes bun recipe, I thought it was really amazing as you can churn bread out in such a short time. However, this 40 minutes bread recipe uses too much yeast and those who have tried find the texture to be dense and sticky by the next day. My experiment 2 days ago proved to be a champion over the 40 mins bread recipe as I have used the super food pumpkin to recreate a new quick bread recipe which uses much less yeast and is healthier too. This quick bread recipe takes all in all less than an hour to churn out homemade bread compared to normal bread making which requires more than 3 hours, amazing isn't it? Egg wash: 1 egg yolk + 1 tsp milk, mix well and strained. 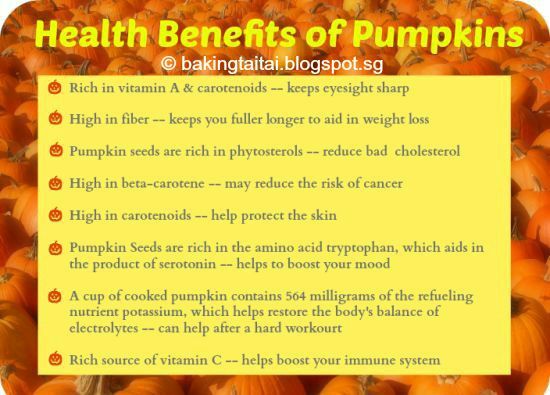 * Prepared in advance - To make pumpkin puree, peel skin of pumpkin, remove seeds and cut into smaller pieces, steam for about 20~25 mins, mashed with a fork. I normally prepare one whole pumpkin, freeze it after steaming and use as and when I need. Cooked pumpkin can be kept frozen for a month or keep in the fridge for a week. **update - please do not over steam the pumpkin or it will become mushy, drain the steam pumpkin water away before mashing, the pumpkin puree should not be watery at all. please refer to my youtube video here to see how the texture of the steam pumpkin and pumpkin puree should look like. 2. 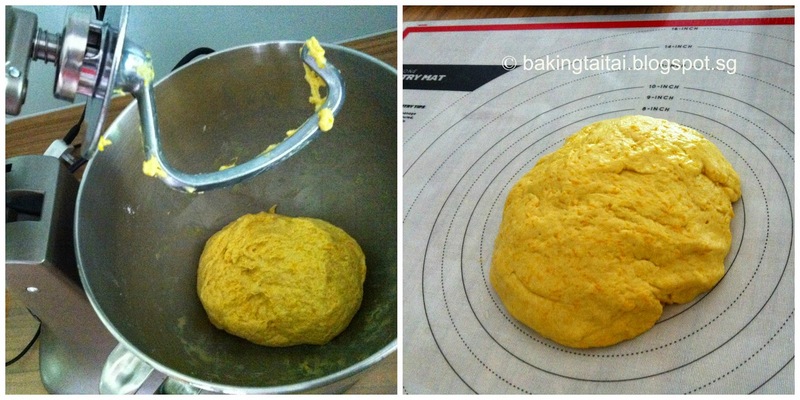 Using your dough hook, mix in the pumpkin puree, salt and flour. ** If you do not have a mixer with dough hook, you can knead with your hands until the dough comes together, soft and smooth, no need to knead till window pane stage. If you have a breadmaker, you can use the pasta dough function to knead about 10 minutes till dough is soft and smooth. 4. Dough will be sticky so grease your hands generously with oil to make handling easier. Divide the dough into 10 balls (about 65g each), rest for 5 minutes, add in your preferred fillings (I wrapped in Muar otah). Allow the doughs to rest for 10 minutes on the baking pan. ** Do not exceed dough resting time as it will affect the softness of bread. 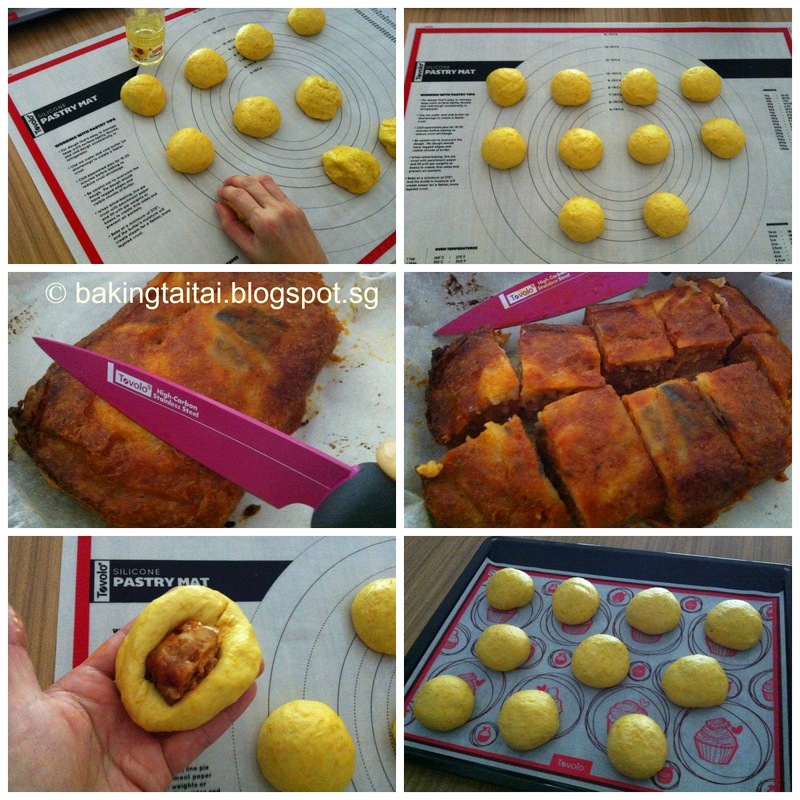 If no fillings are added, after dividing the dough, rest it for 10 mins before putting into the oven to bake. Love the generous size of the Tovolo silicone Pastry Mat and its non-stick material creates an ideal work surface. Though the dough in this recipe is very sticky, it did not cling to the mat at all! The Tovolo paring knife is great for cutting as it has a non-stick blade which prevents sticky food from adhering to the knife and makes cleaning a breeze! The Tovolo baking mat's silicone fibre insulates the baking pan and provides a non-stick surface, thus no greasing is needed and it is easy to clean. 6. After baked, remove from the oven, transfer immediately to a wire rack to let cool. I have used the Tovolo Mini Turner Tongs to transfer the buns. The flat ends create the perfect grip for delicate items and the gentle grip allows a secure hold without damaging food. 7. These buns are best eaten on the day that it is baked and to be consumed within 1-2 days. Heat it up in the microwave for 13~15 secs for better taste if you are eating it the next day. The pumpkin may be replaced by sweet potato, potato or carrot. You will have to adjust the liquid proportion accordingly. Sharing some feedbacks given by those who have tried it. 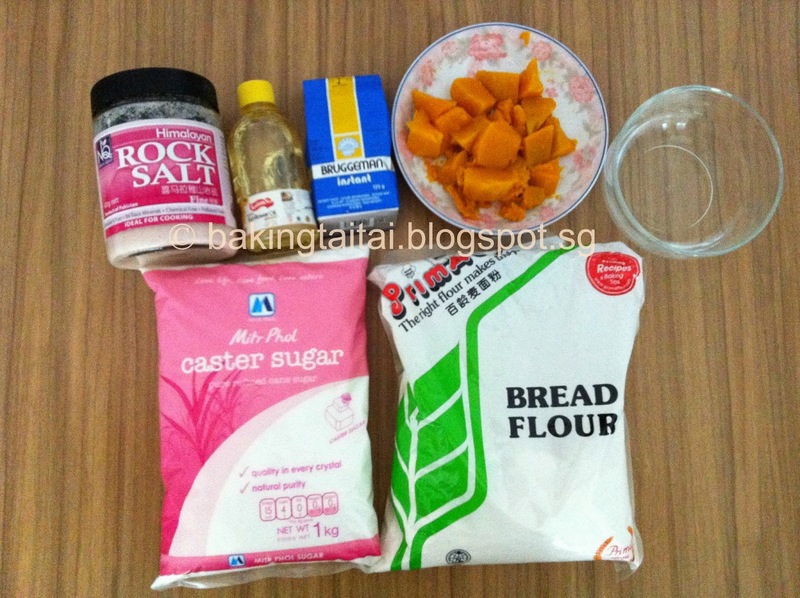 Click 'HERE' to view their bakes which I have shared in Baking Taitai's Facebook page. 1. 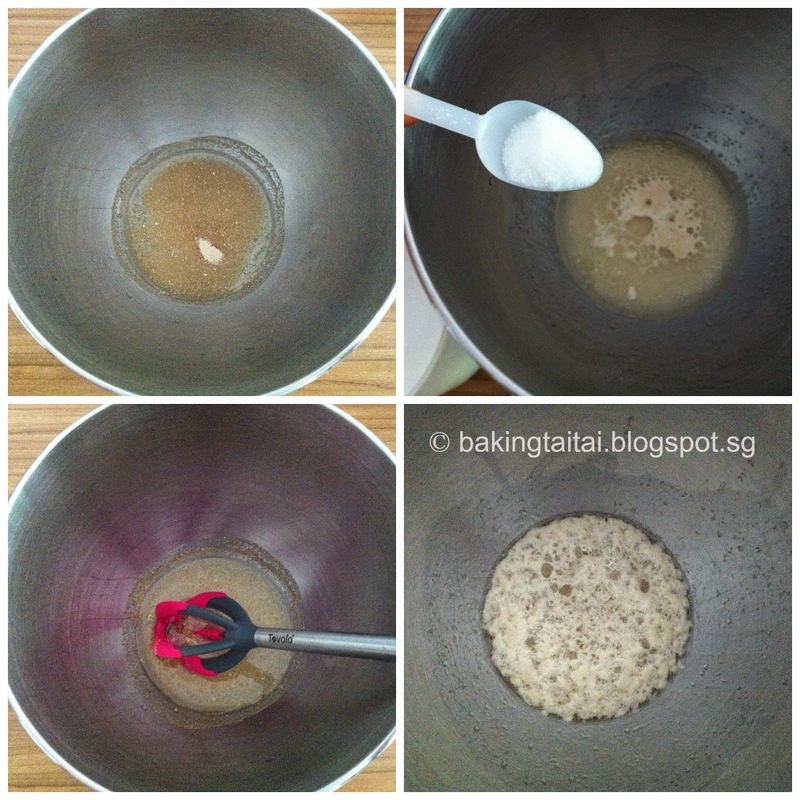 Jennifer Quek - "Though not easy to handle the dough, I am happy with the end result. Though it is still soft the next day, I put it in the microwave for 13~15 secs for even greater taste!" 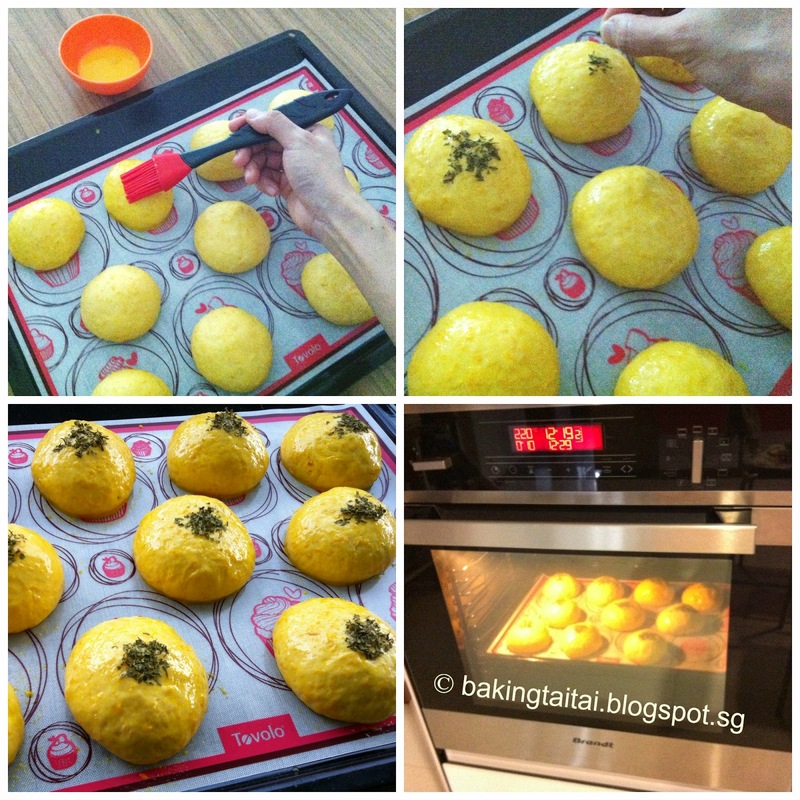 and many more other photos and feedbacks can be found at Baking Taitai's Facebook page - "50 minutes Amazing Pumpking Bread Album". Hi Cheryl, Thank you for sharing this easy bun recipe. Looks really soft and fluffy. Love it! This is what I'm looking for quick bun recipe. Thanks, Cheryl! Wow so soft and fluffy, some more the total time needed is shorter than usual one. Thanks for sharing this. Will give it a try with my leftover pumpkin puree. What can I replace with if I don't have pumpkin? sounds incredible that only requires short proofing time. hope to try that too someday! thx! I think the bread looks great! If I only want it plain, can I just omit the pumpkin? Or do I need to replace it with another ingredients? Thanks! What would you suggest as alternative fillings? I don't really fancy muar otah. Hi Lucaslicious Mom, if you omit the pumpkin, you may replace with sweet potato as the texture is closest to pumpkin. Hi Fonghui, you can try replacing with sweet potato as I find the texture after steam and mash is the closest to pumpkin. Sorry for my late visit for this pumpkin post. This bread recipe looks amazing! Just 50 mins and you can produce this lovely buns... Wow! Your 50 minutes bread is amazing! It's soft and fluffy! Thanks for sharing all your lovely recipes to LTU! Hi Cheryl. Do you bake or steam the Prague before wrapping? Hi Genn, do you mean the otah filling? Yes, I airfried it first before wrapping it in. You can either bake or steam it. Hi Cheryl, can I replace oil to butter? Hi Hwee Yong, yes you can. Hi Cheryl, then when can I put in the butter? also how many grams pls? Thank you. HI Hwee Yong, you have to melt the butter first then add in just like the oil in step 1. To convert from oil to butter, just multiply the amount by 1.14. will do. Hi Cheryl. If I do not want to add pumpkin or sweet potato can it be replaced with more flour? I prefer a simplier bun to add filling. AlSo does using wholemeal flour work? Hi Unknown, I can't advise you as I have not tried it before, I can only advise what I have tried and tested in this blog recipe, hope you understand. You have mentioned above that you have normally stream the whole pumpkin and keep them in the freezer/fridge for future use. Sorry about this, but do you meant that after stream, you put the stream pumpkin into freezer or is after stream, mesh it into puree than put into freezer? And, can you advise how do you keep them in freezer? Inside container? or is there any wrap in foil or? Sorry for the above noob questions. Hi Wendy, after I have steamed the cubed pumpkins, I store it in a freezer safe air-tight container before putting it in the freezer.